If you're looking for the convenience of disposable products without the environmental impact of plastic or foam, look no further than the EcoChoice biodegradable, compostable sugarcane / bagasse 9" plate! Perfect for both hot and cold foods, this plate is an ideal solution for restaurants, caterers, and sandwich shops that serve anything from hot entrees to cold salads and dessert dishes. Serve up lunch or dinner plates, sandwiches, desserts, and more on this 9" plate. With a bright white finish, this plate will fit almost any restaurant's decor and theme and creates a clean and fresh canvas for any type of food. Plus, this sugarcane / bagasse item takes up less storage space than other disposable alternatives, and it can hold heavier foods than either paper or Styrofoam. It is really dishes that we need to serve for the community. It is strong to hold foods. It is very cheap comparing other shop. These plates are sturdy and don't soak through. We appreciate that they are biodegradable as well. They look professional and don't bend. Good size as well. It is so great to a have. biodegradable option for disposable plates. I try to be as eco friendly as possible and I know our customers appreciate it. We got these for an off-site catering event where they wanted everything to be biodegradable. They worked well, and I was happy with the price. Great plate works very well, very sturdy, safe to use in the microwave and overall great for everyday use in all different applications and uses. Good plate option for an eco friendly restaurant. They are durable and stack easily with other sizes. These are larger than the 7" plates we use and fit larger slices of pizza. We love the eco / earth friendly look that these plates provide. They are sturdy and hold up to almost anything that you put on them. Sturdy plate, I love it. you can up food on them and it stands up. we use them for 7 and 9 inch pizzas and they do not leak through. Great plates! Sturdy design. We use these when we send out catering meals when disposable plates and such are needed. People always appreciate that we care enough to have compostable and biodegradable plates as opposed to cheap paper plates. Good looking plates for catering and disposable uses. Nice to have a green option; the customers feel better about ordering. Better for the environment without sacrificing quality. I have to say these compostable plates are my favorite on the website and in general. They hold up the heavy weight food so I don’t have to worry about doubling them or people dropping food. Very happy with the 9 inch plates! Perfect size for small dinners or lunches. Very thick and sturdy. We do pulled pork and chicken and food does not leak through! Great product. Eco friendly sturdy 6 inch plates! This on my rapid reorder list! Does hold up perfectly when rewarming food with a lot of liquid but works fine when doubled up! These plates work really well for or catering needs. the are more eco friendly than paper or plastic plates. they also add a good touch of quality to the corporate events. i used it for parties, so people after used it can throw it to trash. strong plates, eco-friendly , full size plate. i recommend it. I like the size of this plate it works well for our kids meals and half sandwiches. I like the biodegradable as well since we use all disposable it is nice to have something a little better for the environment. I like these plates. Although they are recycable, the material holds very well. They keep cold and hot food and are big enough. I will by more of them. These plates are a perfect way to make your catering pop. Despite being disposable, these plates are cheap and attractive, meaning you get bang for your buck. This is a great heavy duty lunch plate or small dinner plate. Edges are high so food does not spill. Feels just like the more expensive brand we all use for special occassions. But instead you can use everyday. This plate is a great size for a rehearsal dinner. Will be plenty big and sturdy enough to handle even the sloppiest of foods. What a great price! A great quality paper plate is perfect for our company picnics. They are sturdy and hold up well with our bbq plates. They are also biodegradable which is awesome. Yes, it says 9" but it was a little bigger than i thought. Though, I like this plates as it's strong and has "organic" feelings to it as it's not plain bleached white place. good for buffet style dinner. These plates work very well. We use them for anything one would any other type of paper plate. They do become soft if the food is really wet or moist, but they don't fall apart. Definitely recommend and will probably buy again if I need to do so. Love these plates! We use a lot of plates in the office so I love that they are biodegradable and affordable. It is a great price for the amount you get, perfect for stocking up. I love that Webstaurant offers such a great selection of eco friendly products at a family friendly price! My family picnics and goes on road trips quite often, but we still try to make an effort to decrease our carbon footprint since it requires a lot of disposable items to pull it off away from home. These plates are the perfect size for just about any lunch or dinner meal, and they are sturdy to support heavy sandwiches like pulled pork. Excellent product and my customers love the durability. These 9" plates hold generous portions of food, whether its hot or cold and they do not leak. Great job, guys! 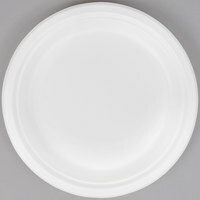 These paper plates are perfect for my catering events and are very sturdy as inexpensive as they are in the 125 pk . We will definitely buy again for home use and catering business. Our customers love how environmentally friendly this option is. Perfect for serving a whole meal to customers, as well as showing that you care about the planet. I absolutely love this product! These compostable sugarcane plates are great for BBQ or parties! They are pretty thick. Love that they are compostable anything to make the world better! These compostable plates are great for restaurants, cafes or home use. Made of sugarcane, these are eco friendly and still hold up well to heavy or wet foods. Pack of 125 is great for smaller events. Great plates for those who wants and eco friendly option. They hold up well to heavy items and items with lots of sauce or liquid. With everyone environmentally conscious, the compostable plates are the only alternative to foam or plastic. I used to use the 10 inch but decided to downsize to the 9 inch in order to decrease portion sizes. These plates are perfect for any event. The plates are strong and you can fit a lot of food in them. The price and quantity are a great value. While the plates went perfect with our country & western themed event, they didn't hold up very well against our chilli beans. The plates held the weight of the barbecue & sides the liquid from the beans proved to be a bit much. We would use these again just not for anything with a gravy or watery sauce. Sturdy product! Hold up well with food on it. Comes in a sturdy box with two stacks individually bagged so that it is easy to store for later use. Nice that they can go right in the compost bucket. These plates are large enough for dinner events, and sturdy enough for larger meals and do not bend easily. We highly recommend this plates especially since they are a more environmentally sound option to alternatives. These places are great for their price. They are strong, stiff, and hold a good amount of food without folding. The only reason I gave it 4 starts is because I feel they are not deep enough. I bought these plates for my wedding. They look great -- the color is nice -- and are very sturdy. Held up well to food. I absolutely love these plates! Not only are the eco-friendly but they are durable and microwave safe. They're amazing plates and I highly recommend them for any disposable plate need. These are great disposable plates, but since they are biodegradable, they should not be used for extended periods of time once they get wet. For the average meal, these should work great. I use them and have not had a wet plate break, but if left for a few hours they break down a little once they get wet. ( inches is a little small for your average meal, so I would probably get 10 or 12 inches next time. I compost these with my town's industrial compost collection, which greatly reduces our waste. There are many times we need a paper plate and this 9 inch EcoChoice plates are very good. They are super study. and hold a god amount of food without collapsing and they are compostable as well. I got these for my wedding reception. I wanted a cheaper option for plates because it didn't make sense to me to rent a bunch of China and pay hundreds of dollars for one night. I also like that I don't have to wash them afterwards! They are thick and durable. Good choice for a budget friendly, green conscious disposable dinner plate. Strong and sturdy, these won't go limp like regular paper plates. Save water....go disposable! These plates are comparable to the much more expensive plates out there. We needed plates to hold up to the hearty dinners and lunches that the church serves. Great plates. Great price. Our family and friends love these biodegradable plates as we do that is better than the store plastic paper plates. Also we love the depthless that it is offers and we feel it is healthy for people and the environment. The key words are biodegradable and compostable. The size is just right and these are strong enough to load up your plate. You can use your normal utensils with no worries. These plates priced right for daily use. These are a great price for an eco friendly plate. I feel better that my shop is making an earth friendly choice, customers appreciate it as well. I will keep ordering these plates. They hold up perfectly too! I tried getting these as a substitute for the Green Wave GSP010 square sugarcane plates and they weren't as nice as the others. They don't feel as strong or look as clean as the Green Wave ones.